Happy Tuesday! Today I’m teaming up with J.McLaughlin to share how I’m making merry at home and sticking to the classics this holiday season. This look is a great option whether you’re headed to a holiday party or hosting one at your home. 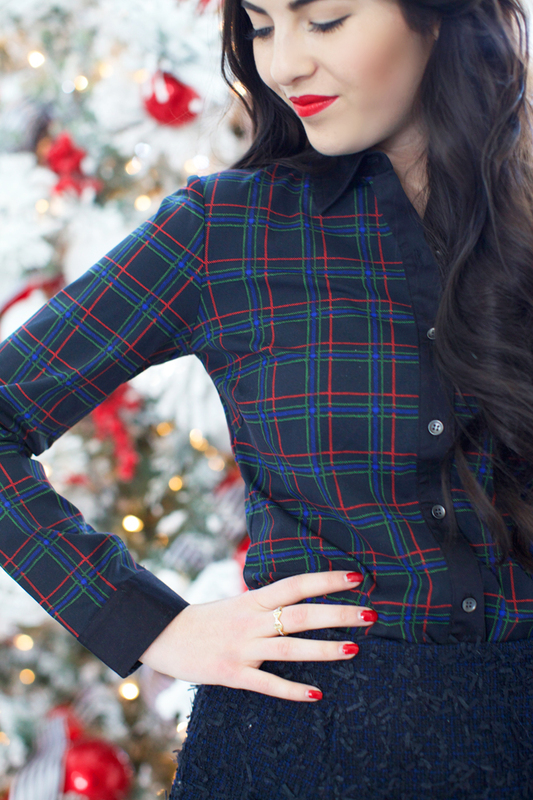 Tartan is one of my favorite prints, especially during the holidays! I can still remember being little and my mom dressing me and my sisters in tartan print dresses for our Christmas card. It’s still one of my favorite prints, it’s a complete classic. Pair it with an embellished black or navy skirt, a beaded black clutch and a classic Christmas red lip to create a timeless and sophisticated holiday outfit. I love to fill my home with classic Christmas decor and this year I went with snowy whites, a pop of red and fresh, evergreen garlands. But I think what brings the holiday spirit into my home the most are the classic Christmas songs that we all grew up listening to. I thought I would share with you my Christmas playlist that’s currently on repeat at my home! I hope this inspires you to make merry at home! And if you’re looking for some classic pieces to add to your wardrobe this season, get 15% off full prices items today and tomorrow using code: MAKINGMERRY. Enjoy!! Kaya Swing Dress, Elm Jacquard Skirt, Grace Dress, Halsey Cashmere Cardigan, Wishbone Knit Hat, Wool Scarf, Kelly Quilted Clutch. Brought to you by J.McLaughlin. Wiw Rach!! What an amazing Christmas decor!! Your tree is huge and amazing!! That plaid shirt is perfect for the Christmas lunch! With those red lines! Yes!! I’m playing too the Santa Baby one! You look beautiful, Rach! Love the outfit and the decorations… and the music recommendations! Where did all of your NM presents go?!!? Don’t tell me they were fake too!! Great outfit! Love your tree, so festive. Love that plaid shirt! Super cute! Incredibly gorgeous girls!! Such a cute and festive outfit and photos! This is a lovely look! Your Christmas tree is so pretty! Gorgeous! I love all of the texture in your outfit! Love this festive post and your outfit is perfection! I love your outfit, and totally agree that tartan is such a classic and festive print! Rachel, this is lovely! 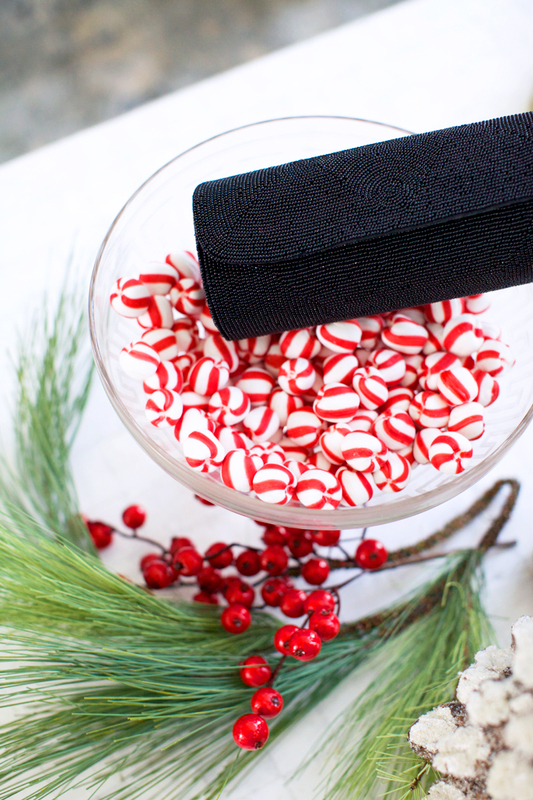 And I adore your holiday playlist… so many classic song vibes! I love tartan prints too, especially this time of year. whether in a dressy look, or cozy jammies, they feel festive and fun. I found a “pop” christmas playlist on Spotify and I love it! Perfect for parties! I love your plaid shirt, so adorable!! Loving all of this. What a beautiful tree and loving the texture of that skirt. Absolutely beautiful! Skirt is my favorite! Your tree looks so beautiful, love the red decor! Hi, I recently discovered your blog and I love it! All of your pictures are beautiful :) Your Christmas playlist is so classic, I love Idina Menzel’s Christmas album. Have you tried Josh Groban’s holiday album? His vice is amazing with some of the classic songs. Your Christmas tree is amazing! Love love love this outfit! You look so cute! So festive! You look gorgeous as always! I love this outfit! you look darling! Beautiful outfit! I love the tweed skirt! That skirt really is gorgeous!! Your house looks amazing for the holidays. I am loving the coziness!! Your Christmas decor is gorgeous! I love how you wrapped those presents! I love this shirt and skirt combo! You look so glamorous and your house oh so fabulous! Have a nice day! I love your outfit, especially the skirt! Those gifts are so beautifully wrapped! Such a lovely and perfect holiday pairing, Rach! I too love tartan during the Christmas season and it’s definitely a classic print. I love how you styled yours with that lovely skirt and bold red lip and nails. I also love your playlist songs, my all time favorite would have to be Brenda Lee’s Rockin’ Around the Christmas Tree”! I hope you have a lovely day, beauty! Sweet post , like it! Such a cute look! And a great playlist too!! I was just introduced to this brand recently, it looks gorgeous on you! What a stunning and classic ensemble for this time of the year. I love the textures of your skirt and clutch. Very pretty! I really like how you paired this plaid shirt with a more formal skirt. I have been loving your Christmas tree posts! It’s absolutely beautiful! nice outfit! My Xmas playlist has a lot of Michael Bublè and Mariah Carey! Wow…what a beautiful decoration. That tree is a dream ❤️ and what an elegant outfit. Love it! I love Christmas time!! You look so pretty ! I love your christmas tree & this simple but elegant holiday look. So festive and gorgeous! I love tartan as well. Thank you for sharing your Christmas playlist. I needed to create a new one and this is just perfect! I love your skirt! That fabric is super cute and looks nice and warm too! Beautiful holiday style and atmosphere! What a lovely outfit. Cute skirt.